Eileen and I spent a long weekend in the Okanagan Valley here in B.C. We went out there to visit a few of the many wineries in that region, do a bit of sight-seeing, and relax a bit. We were not disappointed. We stayed at the Heritage Inn in Naramata. Its an old restored hotel set in a sleepy little village at the end of the road from Penticton. We spent a lot of time eating and drinking at the wine bar. The hotel has a very relaxing atmosphere and we enjoyed ourselves quite a bit. We visited a dozen or so different wineries in the region stretching from Oliver to Naramata, stopping at as many vineyards we knew as those we didn’t. It was a fantastic way to discover new places and rediscover the places behind the names we knew. Our favorite location for the all-around experience was Lake Breeze. Their Pinot Blanc was perfect for sipping before lunch on their patio, and their food from the outdoor kitchen was terrific. We tend to drink more reds than whites however, so we had to press on searching the other venues. The two most interesting locations were Elephant Island and Silver Sage. Elephant Island specializes in non-grape wines. We almost passed as we didn’t really have high hopes but we’re glad we took the chance. Their pear wine is very delicate and their Cassis is amazing. Silver Sage offers some truly unique products like a Gewurztraminer soaked in sage and a late-harvest dessert wine with a jalapeno pepper in the bottle. Their name for this weird concoction Flame is quite appropriate. Their logo is creepy though. Our favorite reds came from Kettle Valley and Burrowing Owl. Both offerings will need some time to mature, but a couple of years in the cellar will do the job. The picture in the corner above is a snapshot of a few of the wines we purchased on the trip; our wine rack is now pretty full. We’d highly recommend a visit. 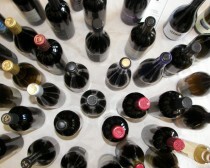 Three or four days is more than enough to make a serious study of wine and food. And the scenery is quite pleasant too! Last week we watched two very different movies: Inside Man starring Denzel Washington and Clive Owen and directed by Spike Lee; and Brothers Grimm starring Matt Damon and Heath Ledger and directed by Terry Gilliam. Inside Man was a delightful heist story with a great twist. The players were fantastic and the time-shifted scenes of witness interviews added a great touch of intrigue. I found the side-story with Jodie Foster’s character completely unnecessary – it was obvious that the banker (played by Christopher Plummer) had a lot to lose from the heist, even if the specific thing to lose wasn’t blatently stated. The over-the-top “problem solver” character played by Jodie Foster really didn’t move the story along as much as the director probably thought it would. Even so, this was a great film. The Brothers Grimm was disappointing. Watching the film you can tell the script had real promise but everything went very wrong from the second scene. The first scene was really delightful (it was the adventure in the barn recreating then destroying the local ghost) but after that it was pretty dismal. We found most characters were over-acted to the point of not being funny, and the entire movie turned out to be a mash-up of odd scenes adapted from classic fairy tales but sculpted around what cast members happened to be handy at the time. The only redeeming part were the wonderful costumes. If you also lost 90 minutes to this tragedy then you have my sympathies. On Saturday Eileen and I went to Flugtag Vancouver downtown at Science World. It was a hot, sunny day here so we didn’t stay more than a couple hours but it was a lot of fun. There were thirty one teams competing, we saw about half of them throw themselves into the water. I’ve heard of this event being held in many places in Europe but apparently its been held in North America too. This was the first time it was held in Canada though and teams came from as far away as Quebec to compete. 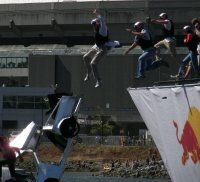 If you’ve never heard of Flugtag before, go check out the site linked above to get some background. On the lower-right side of the page there is a small movie showing how the flying is done. Teams also get points for their costumes and for a little skit (usually dancing) before the big launch. The whole thing is a real laugh. The event was sponsered by Red Bull (that energy drink thing) and started with four parachuters dropping in from about 5,000 feet with smoke packs on their feet. They did some wild acrobatics on the way down, smoke trails intertwined as they performed a sort of ariel ballet. 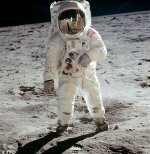 Their landing zone was the same launch platform as the other flying machines would later fly (sort of) and drop from. Three of the four guys hit their mark, while one guy splashed down. It was a great start to kick off the event! I was really amazed how fast these guys come down. None of the machines we saw went much further than 10 feet. 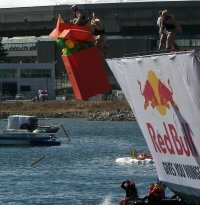 The world record for such Flugtag human powered machines is 170 feet. Clearly some people brought along real hang gliders and such with the hope of flying high, but without fail they all went into the drink the same way. I suspect a traditional glider just won’t generate enough lift in their short freefall. We later heard one team made it 80 feet or so, it must have been quite something to see. I’ll have to see if I can find a team to join next year. It looks like a lot of fun to build and launch one of these contraptions, even if it means you end up jumping twenty feet into the water at the end of it. I’ve uploaded some pictures from the day here. Finally got some time to create and post pictures and movies of my six-legged walking robot known as The Metal Insect. Sure it’s not a creative name, but I wasn’t able to think of a better one and nobody has suggested one yet.